Vinyl pools are incredibly affordable, but often present maintenance problems. Vinyl lined pools are the most affordable kind of swimming pool you can buy. 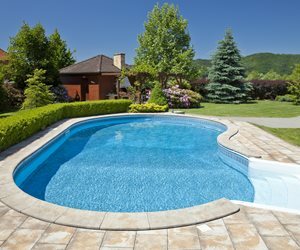 They are not new, but demands in the market are resulting in many innovations that offer custom pool features adapted to this unique construction method. One of the primary drawbacks of vinyl to consider is home resale value. 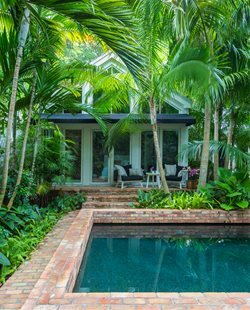 This kind of pool may not add value to your property as would a fiberglass or gunite pool. In some areas it may indeed be viewed as a liability. It's not uncommon for buyers to ask sellers to replace the liner prior to closing on a house, just to ensure the maximum time elapses before replacement is necessary. In general, the low cost of vinyl is due to the minimal amount of raw materials required for the installation. 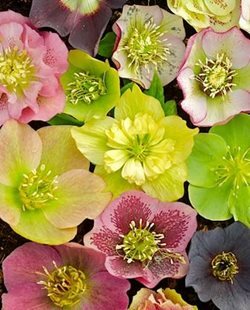 However, this is a big labor project so the price you pay is more about installation process than it is material costs. In general, a vinyl lined pool with deck ranges from $20,000 to $40,000. Vinyl pools are smooth on the inside and therefore very easy on your feet. Because vinyl is a non-porous surface, it is less appealing to algae and maintenance requires fewer chemicals which lowers operating costs on a day to day basis. 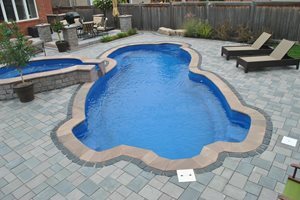 Vinyl also lends itself to a wide range of shapes and sizes since it's not limited by the need to haul it to the site as with fiberglass pools. There is also a much larger, if not unlimited opportunities for greater width and depth, which is important to divers. Vinyl liners are prone to tearing around the top. Repair of a punctured liner is possible but unsightly. Vinyl liners can show stains and fading. If water collects under the liner, then drains away, the vinyl is stretched and often results in a crease that may, under continuous pressure, tear. Steps and benches may prove unattractive or fail to match the rest of the pool. 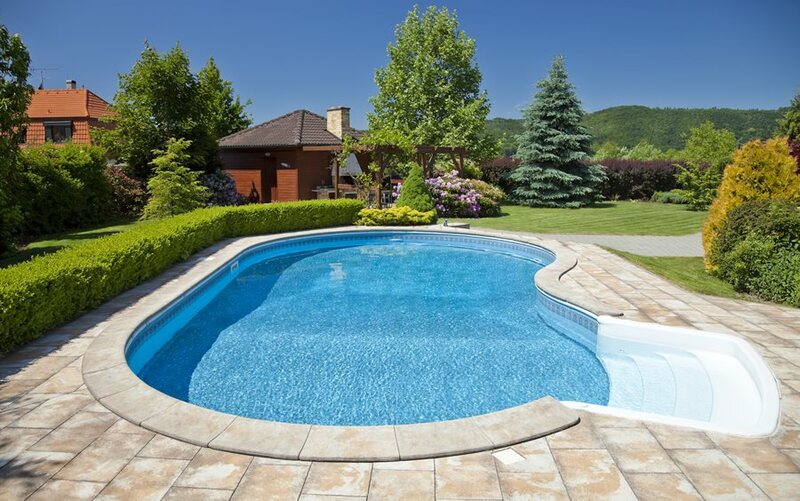 Vinyl liners offer little insulation, losing much heat to the soil mass, making these pools cost more to heat and keep it comfortable year around. The Achilles’s heel of liner pools is the liner's longevity. Over the years the composition of vinyl liners has changed with the introduction of new materials and composite technologies. These improve durability with warranties ranging from 20 to 30 years depending on the manufacturer. However, life expectancy of the liner can be directly tied to wear and tear making the average life expectancy much shorter for a large family with kids than it will be for a quiet retired couple. Also considered is maintenance. There are fewer chemicals used which cuts down on chlorine bills. Even the best liners will fade, particularly when exposed to high UV levels. 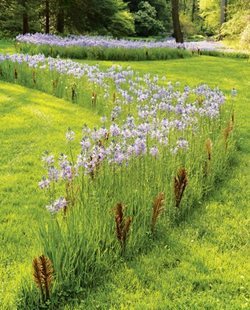 Fading liners is why it's become customary to replace the liner every 8 to 12 years, even though it isn't leaking or has other problems. Owners will expect to pay about $4000 to replace the liner. For some this is avoided at all costs, but those who want their pool to look brand new, the ability to change the liner is desirable. How the pool is to be used is an important part of the selection process. A pool liner is only 20 to 30 millimeters thick, which is the equivalent of a few pieces of paper sandwiched together. It's primary weakness is puncture, which can be caused by pool toys, dog claws, and of course kids. A puncture may require the entire liner be replaced, which is many thousands of dollars. 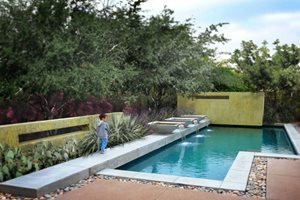 Coping is the edge condition of your pool where it meets the deck. This is the most common location for tears. Many contractors use aluminum C-track systems to make it easier to pour concrete around the edge. However, this is not an attractive choice and many insist on cantilevered coping to ensure this practical aluminum anchor be hidden invisibly beneath it.